England’s Test opener and leading run-scorer Alastair Cook on Monday announced that he will retire from international cricket after the fifth Test against India. 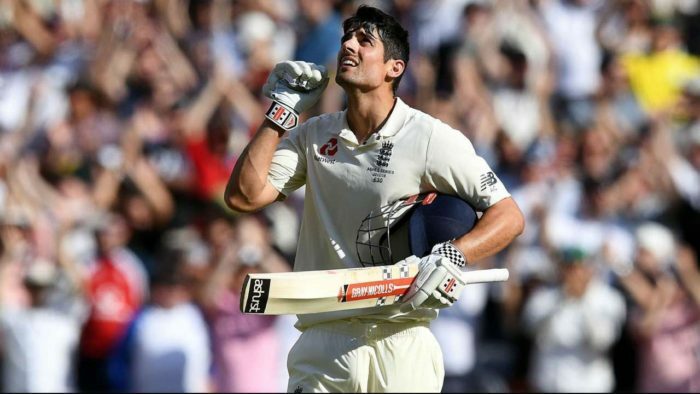 “After much thought and deliberation over the last few months I have decided to announce my retirement from international cricket at the end of this Test series against India,” Cook was quoted as saying by the International Cricket Council (ICC). “Although it is a sad day, I can do so with a big smile on my face knowing I have given everything and there is nothing left in the tank,” The 33-year-old added. Cook was the leading batsman in two of England’s greatest overseas triumphs in Test history, England’s Ashes win in 2010/11, and their victory in India in 2012/13, according to the statement issued by ICC. “I have achieved more than I could have ever imagined and feel very privileged to have played for such a long time alongside some of the greats of the English game. The thought of not sharing the dressing room, again, with some of my teammates was the hardest part of my decision, but I know the timing is right,” he said. “I have loved cricket my whole life from playing in the garden as a child and will never underestimate how special it is to pull on an England shirt. So I know it is the right time to give the next generation of young cricketers their turn to entertain us and feel the immense pride that comes with representing your country,” the former captain added. “Graham was my sounding board, especially in the early years of my career, spending hour after hour throwing balls at me with his dog stick. He made me realise you always need to keep improving whatever you are trying to achieve,” he added. “My family and I have had 12 wonderful years fulfilling my dreams and this could not have been done without them. So I wish to thank my parents and brothers, my wife, Alice, and her family for their quiet, unwavering support behind the scenes. As cricketers, who travel frequently, we often don’t realise just how important our families are to our success,” the left-hand Test opener said.